Babies, Puppies, Children, Humor, and Villains all have one thing in common – they all make a terrific film! The animation is colorful and has lots of details. The storyline is cute, silly, original and fun for the whole family. In the story, Tim wants all of his parents’ love for himself because he was an only child for so long and he is new to the idea of sharing love with his new baby brother. I can relate, since my sister was not thrilled about my arrival. It took her a while to adjust to sharing our parents. Now we are best friends forever. This leads to the lesson that there is enough love for everyone and we can always share. The issues of feeling like you are being replaced and not sharing love with others are two major lessons every brother or sister learns at some point in their life. These are huge and valuable lessons to learn when you are young or about ready to have a new sibling themselves. Plus, a brother or sister means you have a best friend for life. Each actor is very unique with individual personalities and quirks. Tim (Miles Bakshi) is my favorite character for he reminds me of many people that I know. His transformation warmed my heart and made me all giddy inside. 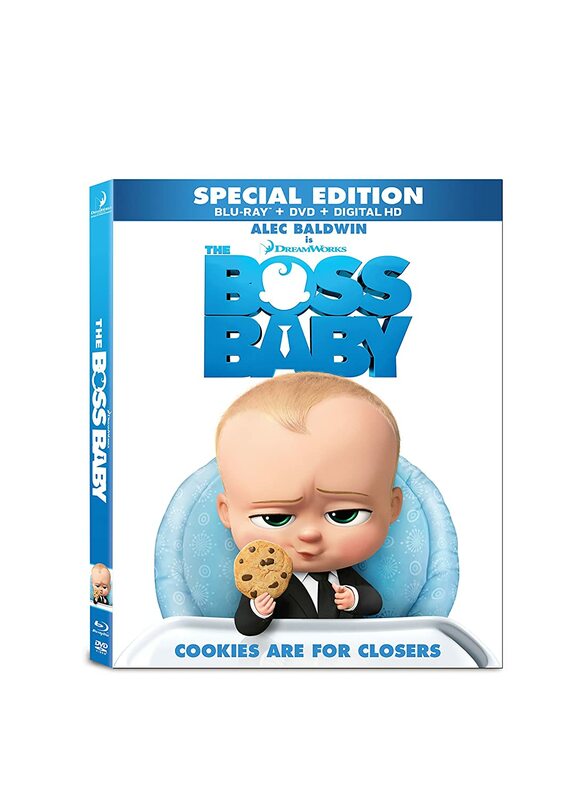 Boss Baby (Alec Baldwin) is the Baby that you want in charge. I love the way that he is so commanding yet kind and silly whenever you talk to him. He is the man with a plan. He knows what to do when you are in trouble and has an adorable little hand to help you on your journey. Francis Francis (Steve Buscemi) is the evil mastermind that you call when you want something that is adorable to the eye, but when you see it up close his plan is just down right diabolical. Dad (Jimmy Kimmel) and Mom (Lisa Kudrow) are the perfect parents when it comes to sharing love with two adorable young men. The animation is very bold and detailed. I love how each and every detail is addressed in the animation. The animation keeps you interested since there is so much to see and so little time. My favorite scene is was when Tim and The Boss Baby pretend to be pirates and come up with fun pirate sayings and acting as silly kids. I love this moment because there is so much joy and excitement to it. I wanted to jump into the screen and get into the action myself. When Tim teaches Boss Baby how to be a pirate, I laughed and found that I was learning how to act like a pirate too. The way that Tim and Boss Baby make a team of scaly wags is perfect. I wouldn’t have it any other way. The Boss Baby has many references to films and people that I adore that made me laugh and make the movie relatable to a broad audience. They touch on Mary Poppins, Evil Knievel (I know about him from my Grandfather as they were neighbors and grew up in Butte, Montana together), Pirates of the Caribbean and a bit of Star Wars. This entry was posted on Tuesday, August 1st, 2017 at 12:52 pm and is filed under Film Critics Blog. You can follow any responses to this entry through the RSS 2.0 feed. Both comments and pings are currently closed.